Two weeks ago in our Leadership 2020 program I experimented with using a signification framework to harvest a World Cafe. We are beginning another cohort this week and so I had a chance to further refine the process and gather much more information. About ten minutes of hearing some random insights from the group, and checking to see how those resonate. 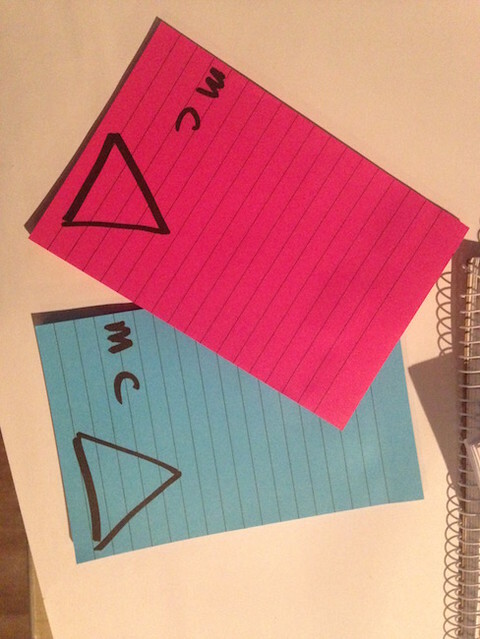 Each participants took a pink and blue post it note. On the blue post it they wrote what they needed to learn that would be immediately applicable and on the red ones, learning that is needed to prepare for the future. 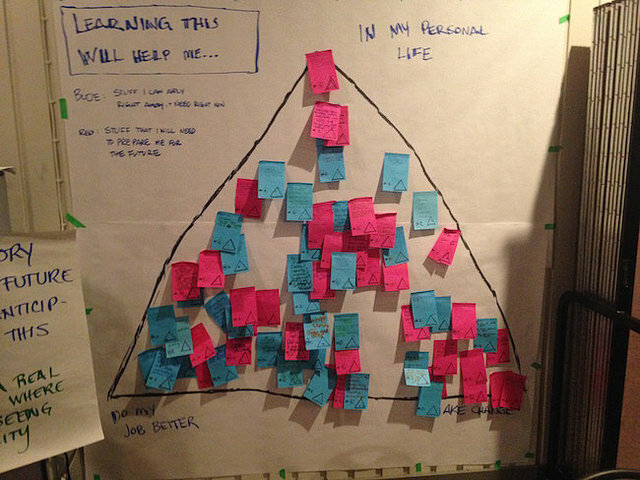 Participants also indicated on the post-its whether the worked for the Ministry or worked for a community organization. At the conclusion of the exercise we had a tremendous amount of information to draw from. Our immediate use was to take a small group and use affinity grouping to identify the themes that the whole has around their learning and curiosity. We have used these themes to structure a collective story harvest exercise this morning. Removing all the pink post-its to see what the immediate learning needs are and vice versa. examining the clusters at the extremes to see what ot tells us about personal needs, and professional needs. Uncovering a theory of change by looking at the post its clustered around the “Making change” point and also seeing if these theories of change are different between the community and the government. And of course because the data has been signified on each post it, we can recreate the framework easily. The next level for me will be using this data to create a Cynefin framework using the four-points contextualization exercise. Probably won’t happen in this cohort. Big learning is the rich amount of data that proceeds from collecting finely-grained objects, allowing for disintermediated sense-making, and seeing all these multiple ways in which signified data can be used to address complex challenges obliquely, which allows you to get out of the pattern entrainment that blinds you to the weak signals and emergent patterns that are needed to develop emergent practice. This pen and paper version is powerful on its own. You can imagine how working with SenseMaker across multiple signification frameworks can produce patterns and results that are many magnitudes richer.